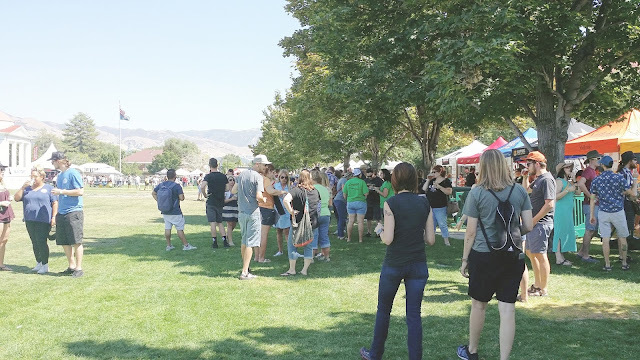 My friend Tony and I went to the Annual Beer Festival in Salt Lake. 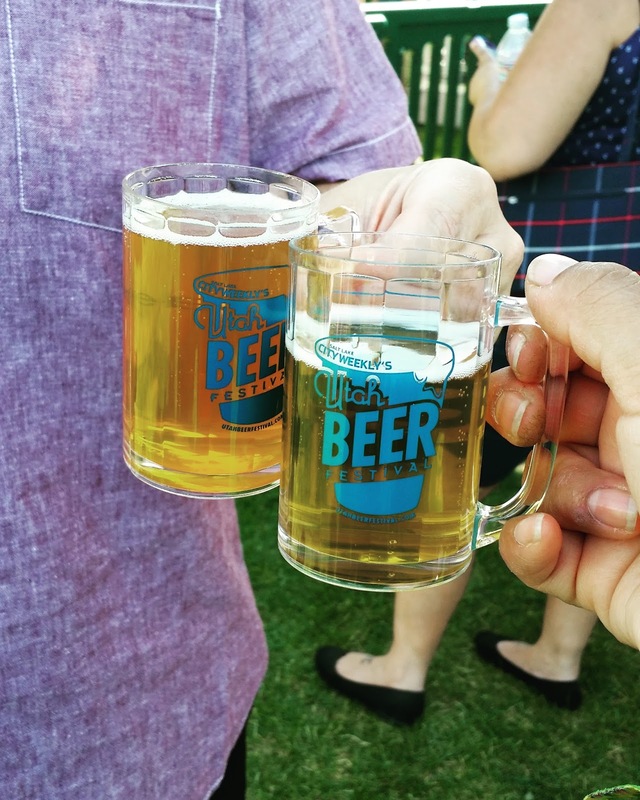 I've been wanting to go the beer fest, for some time but never could because I'm usually working on the weekend. Luckily Tony, thought of me and was nice of him to organize our day at the festival. This year, the festival was held at the Utah State park. I was kind a of hesitant to head out there because we were planning to use the transit system. Tony was not to please of how many stops and far the walking would be, it would've taken us over hour and half to get there by transit. So we opt for the driving, driving there was just over forty-five minutes. We arrived got in line, they gave a wrist bands. We load our wristbands with "tokens," and we want to sample a beer the vendor will scan our bands to purchase the drink. Oh yes! they also gave our little sample cups a 5oz. we could go more but I thought the 5oz. was a suitable size for me. Tony wanted to try more of the hard cider, me I wanted to try whatever was out there: since it was my first time at the festival. We went to building that house the hard cider, one vendor had soda-type beer/cider. I tried a peach cider and green apple cider, oh my they were very bubbly but very sweet, and tart. We also had lunch at the festival, quite a few food trucks. Good thing we had something I don't think I would of made it on a empty stomach. The same food truck from the Craft Lake City was at the beer fest, so we went there and had their bowls. We just walked the park and checked out the beer vendors, some came from a lot from Colorado and Oregon, few from California and Nevada and of course some from our state. I sampled more of light beers, there was quite a few IPA. But I'm more favorable of something light and not too hoppy. I'm more of hefeweizen, and wheat beer kinda gal, hahaha. They also had some music playing, I was kinda disappointed in the seating and the shade. It was sunny, I guess we could of brought our chairs if we would've known I would brought them with us. Some fun and games, and karaoke. I had a great time, I hope my friend Tony did too. After our beer sampling, we have cravings for ice cream so we looked around the food vendors but no one was; so we end up leaving and getting dessert somewhere else. Outside at the Utah State park, it may not look crowded but after an hour it did, good thing it wasn't too hot but sunny. So we left the festival and head over to Gourmandise, near downtown. 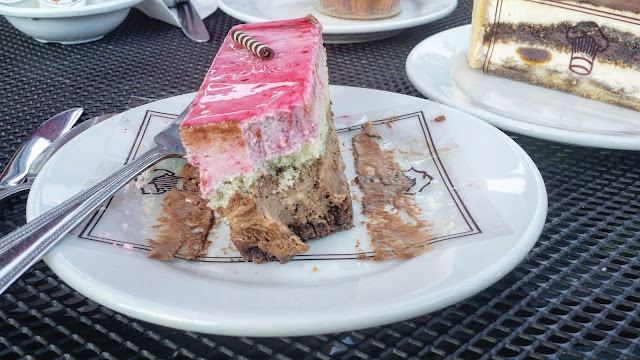 We had our desserts, I had two! I overindulge but it was so good! That was my August adventures, I think August was a good month with cool events. I'm actually happy with the events last month. I'm proud I went out and did something fun. So happy. I know it's the middle of September already, can't you believe next Thursday will be first day of fall. Oh my gosh! I'm still trying to figure out what to make for treats and cards and getting ready for MY holiday (first day of fall). Uughhh! I'm overwhelm right now, I think it's going to be simple this year.